Hold on. Here’s when we hit the wall. VPN Unlimited is limited to 5 simultaneous connections. Ouch. In this review we will look into pros and cons – Safety, pricing, support and more. In the end, we will give our honest opinion of the service and a list of thing we like and don’t like. Data-logging is the act of collecting users information. 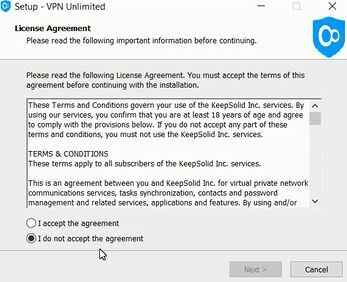 Many VPNs do it, so does VPN Unlimited, yet we don’t like approve this policy. Logging user data can work against the user, it’s a bad practice of free VPNs and even worse for paid services. Remember the Marriot leak? – Over 500m hotel accounts were leaked with personal data. It may seem like the Marriot was uncareful with the stored data, yet it might not be the case. Even world-class internet brands are vunerable – Adobe and Yahoo leaks in 2013, one of the most recent one – Facebook. In the verdict, any personal data in the hands of a third-party company is a threat for the user. There are no “unsinkable ships”. They log IP, Network Name and Cookies. Yet if your main focus is to bypass country-restricted content, it might still be a good fit. DNS leaks are security flaws that allow request to be revealed to Internet Service Provider (ISP) DNS servers. These leaks happen when VPN is poorly designed. VPN Unlimited was tested with 5 different DNS leak tools. These webtool help to analyse whether your IPv4, IPv6 and even WebRTC leak while a stable connections has been established. Both IPv and WebRTC are unique IP address protocols for identification and location definition. This is what we found – VPN Unlimited leaks your DNS. To be 100% certain, we took another test. Yet it failed again. 14 Eyes is an agreement for cooperation in signals intelligence between 14 countries. VPN Unlimited headquarters locate in USA, which is part of “14 eyes” countries, allowing to share personal data about their citizens. During the NSA leaks scandal in 2013, E. Snowden revealed the espionage details, which confirmed the UK-US agreement dating back to year 1943. This is not just a privacy concern for citizens, yet a much broader problem – Jurisdictions acting against their own laws. This has a long history dating back to 1996, when The Independent reported about NSA tapping UK phones at the request of MI5, allowing them to bypass their own laws and evade limitations on domestic telephone tapping. Advanced Encryption Standard (AES), originally known as Rijndael is a subset of block cipher. Developed by Belgian cryptographers, Joan Daemen and Vincent Rijmen, AES-256 bit has remained an industry standard for secure cryptographic connections. VPN Unlimited has includes both AES-256 bit and his younger brother AES-128. Protocols are important as well. Protocols perform a security function and apply cryptography, they describe how algorithms should be used, think of them as military vehicles, which transport your data from one bank to another. VPN Unlimited has OpenVPN, IKEv2, KeepSolid Wise TCP/UDP for main OS platforms. Each of them is different in terms of speed and security. Our Favorite is OpenVPN TCP. country has restricted VPN use (China, UAE, North Korea, Iraq, Iran, Oman, Russia, Turkey, Uganda, Venezuela, Belarus). Yet some high-population countries like China has regulated the use by allowing only government-licensed VPNs. As a tourist, you might be in a trap, as nothing really works in Chinese network, as in US, Google, Youtube and more services are not reachable. As China didn’t release any public list, we decided to do a test ourselves. Lets see If VPN Unlimited works in China, first lets try to access their website. No luck.. Unfortunately trying to access VPN Unlimited inside China (using CHINA UNICOM China169 Backbone ISP) didn’t work as well. Server speed is the rate of change of an object position. In terms of internet speed, it’s the change of the data position. Measuring speed can be tricky, as people across the globe have different local internet speed and the difference in destination servers. Yet as we have measured more than 50 VPNs, the results are comparable and we can give you a reliable results that place the service into 3 boxes – Fast, Average or slow. VPN Unlimited got really good results. After speed tests while being connected to the service local, US, UK and Asia servers, this VPN proved to rank as high 2nd place. This is the strongest feature we found on this service. If you want to have a wide-range of connection countries, it’s a good choice as well. 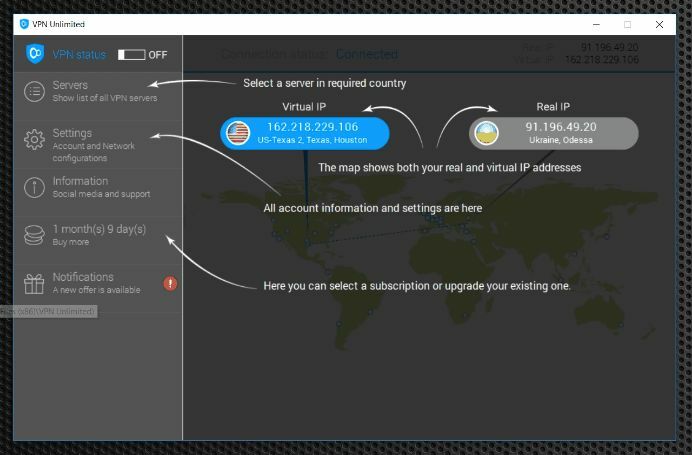 VPN Unlimited offers 400+ servers racked inside 70 countries. Customer service is to assist clients in making correct use of a product. Support quality can be measured by a comprehensive and easy-to-use FAQ page, communication tools used by the host, response time and representative’s communication abilities. VPN Unlimited has a decent FAQ page with more than 65+ pre-answered questions. The questions have been categorized and written in plain English. If you don’t speak English, it will be more difficult for you to get an answer. VPN Unlimited provides support by e-mail or live chat. To measure their response time, we sent over few simple questions trough both channels. By e-mail we got a reply quite quickly – Total time: 10 min. The live chat was even more responsive. In our case, we got an quick and complete answer within a minute. Price is the quantity of payment requested for a service. The price is influenced by the resources needed for the maintainance, market demand, competition and greediness. Usually VPNs price ranges from $2 to $10 per month and variate by subscription time. VPN Unlimited offers 4-types of subscription plans – Monthly, yearly, 3 years and a lifetime. Monthly price is $9.99/mo, yearly $5 (-50%), 3 years $2.78 (-75%) and lifetime is $199.99. All of these are relatively cheap excluding monthly package. For $9.99, you can find a long-list better performing VPN services from the ranking page. If they disappoint your expectations, you can always use their 7-day money back guarantee to ask for a refund. Usability is the ease of use of a tool. This can be measured by effectiveness, customer satisfaction, efficiency and intuitiveness for a specific customer group. For a VPN, there are 3-steps we keep account of – Setup time, User Interface simplicity, reliability (bugs, errors). Setup was like buying a new laptop off the shelf and driving it home near 5-min distance. The process is easy even for a beginner, if you know what you are buying. Just to make sure you won’t bring a Trojan horse into your garden, lets test it with VirusTotal. The test is a simple one, we just download the setup file, load it to Virustotal and let it do its job. Virustotal test was successful and the package passed virus test. No malware was found. VPN Unlimited comes in 4 different shapes – for desktop, phone/tablet, SmartTV, router and browser extension. Routers – AC56U DD-WRT, R7000 Tomato, and more..
App permissions is the terms of agreement of an application. When downloading an app from Google Play, Appstore you will notice your phone asking if you confirm the permissions along with the software. Just like with terms of service, not many pay too much intention to their importance, yet it’s like signing a contract. There are 2 categories of permissions – Dangerous and normal. Dangerous permissions can evade the users privacy, like asking for a location, accessing contact details or use of microphone. The collected data can either work for the use of the user or in worst case, leak the users personal information to unknown destinations. FOREGROUND_SERVICE – Allows the app to use Service.startForeground. BILLING – Allows to bill the user. Needed for In-App purchases. All of these permissions are categorized as normal. The only exception is ACCESS_FINE_LOCATION, which lets the service access your location. Yet for a VPN, it’s inevitable. Netflix is an American media company with over 139 paid users. After being subscribed to Netflix you only see country-specified content, depending of your location. To gain access to all movies, you would have to change your IP address, which may sound rude, yet perfectly legal. Netflix is intentionally blocking VPN IPs for this purpose, but not all of them. The goal of this test it to see if VPN Unlimited works with Netflix. We bought Netflix subscription and turned on the VPN. After a refresh and click on a random TV seriese, we managed to access Netflix. Test was successful. Torrenting, origin. word “Torrent”, is a p2p technology that allows users to change files between two or more devices. Torrenting has a bad rep due to copyright issues, yet it’s a case of misuse. Torrenting is discouraged or not available with some VPNs, even if claiming otherwise. To find out if VPN Unlimited works, we ran a quick test. The result – It works. Pros and Cons are advantages and disadvantages, which we consider carefully. After reviewing more than 50 VPN services, it’s quite easy to compare them and recognize service competiveness. The first thing to recommend to the development team is to upgrade the features – Unlimited everything, it would make sense, name-wise. Yet it’s just a small label on the machine. There’s much more.